Michael Ableman has achieved something many thought impossible: creating thriving urban farms on pavement and contaminated soil in one of Canada's poorest neighbourhoods. 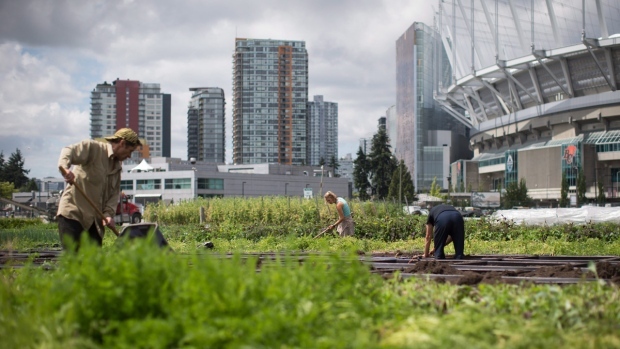 Sole Food Street Farms in Vancouver's Downtown Eastside is an area almost entirely inhabited by folks who are dealing with long-term addiction, mental illness and poverty, says Ableman, who co-founded the urban farm venture in 2009 with Seann Dory. The area of squalor -- nestled amidst a vibrant city with a red-hot housing market -- has the highest rates of HIV and hepatitis C per capita in North America and a high concentration of open prostitution. Yet it also contains an unexpected oasis of green, where about 30 workers from the community spend their days planting seeds, nurturing plants and harvesting arugula and salad mixes, carrots, beets, radishes, tomatoes, strawberries, peppers and beans. There's an orchard with about 500 trees bearing fruit like persimmons, figs, quince, apples, pears, plums and cherries. The crops grow in 10,000 specially designed containers on what were once vacant lots. The urban farm, one of the largest in North America, has helped deal with the chronic problems in the community. "You walk down Hastings Street in the middle of the afternoon and see somebody on the sidewalk with a needle in their arm or somebody else kind of pirouetting in the middle of the street high on crack and you make judgements. We all do," says Ableman. "These are the folks we work with, but all those people have hearts and souls and the desire to do something meaningful in the world and all we did was set the table by providing that opportunity." Lyle Hayes takes enormous pride in tending the orchard. He's worked there since he helped clear a few thousand wooden pallets from the lot to make room to plant trees about six years ago. "I love working there. I just love it," he says in a phone interview. "They're all just great people. No judging about your situation or your demons." Hayes, 50, has lived in the Downtown Eastside neighbourhood for most of his life. "I'm a heroin addict for 25 to 30 years. I'm not ashamed of it. It's how it is. "I jumped off an 18-storey building, tried to commit suicide in 2002, but I hit the 15th balcony going down and I was badly, badly hurt. I shattered both my feet so that's basically where my opiate problem kind of picked up more than usual." Now he's happy to take time out from his farm duties to help prepare a daily meal six days a week for about 80 people in his building. He also helps sell the produce at farmers markets. Participants at Sole Food Street Farm also learn life skills like cooking, basic financial literacy and canning. "We have a breakfast program, teach people how to drive, provide rain gear when necessary, take them to the hospital or pick them up from jail," says Ableman, who documents the "warts and all" story of the project in his new book "Street Farm: Growing Food, Jobs, and Hope on the Urban Frontier" (Chelsea Green Publishing). "We're having a profound impact on people's lives, that's the important piece, far more than I would ever have imagined, ever have imagined, I can tell you," he said at this year's Terroir Symposium for members of the hospitality industry. Ableman was initially approached by some aid organizations in the Downtown Eastside neighbourhood that recognized their solutions weren't working. They had a half-acre at their disposal and thought growing fresh food would help provide jobs and nourishment in a neighbourhood that needed both. Ableman teamed with Dory -- who was working with United We Can, an organization that gave jobs to people in the neighbourhood to clean up the streets and alleys and recycle cans and bottles -- and ended up envisioning, creating and running the Sole Food Street Farms project. Individuals who not only had no skills but who are considered hard to employ now produce 25 tons of food annually on close to five acres of pavement. The artisan-quality produce is given to people in the community and sold to 60 of Vancouver's top restaurants. "These are not volunteer jobs. Let me be clear. We've paid out in the eight years we've been operating millions of dollars in wages," says Ableman. "When people have living things that depend on them, a reason to get up out of bed every day, a community of people that are relying on them to show up, the neighbourhood who depends on the food, this is the amazing thing ... all these things put together have provided an atmosphere and a sense of community and a reason for people to live," says Ableman. "For many of them it's their only meaningful engagement so this has been a great, wonderful thing." A 2013 MBA study done by a team at Queen's University determined that for every dollar paid to staff, there is a $2.25 savings to the health-care, social-assistance and prison and legal systems as well as the environment because the food is produced locally. There are challenges. They have enormous theft, vandalism and rodent issues. Absenteeism is common. "On a day-to-day basis we never know for sure who's going to show up so we have an employment model that allows for people to fall off the wagon. We have to. They don't lose their jobs. Other early challenges included just figuring out the basics of how to grow under difficult conditions. They've developed an innovative system of stackable plastic boxes with interconnected drains that can be easily moved using a forklift. Pinpoint seeders enable planting seed at high densities. They doubled production space by anchoring some 4,000 strawberry plants on three-metre PVC pipes that surround the site. Ableman, 62, who owns Foxglove Farm on Salt Spring Island, is no stranger to helping the impoverished benefit from urban agriculture. The speaker and author of three other books founded the non-profit Center for Urban Agriculture in Goleta, Calif., in the mid-'80s. "We did projects in places like Watts (in Los Angeles), which makes the neighbourhood I work with now in the Downtown Eastside ... look like Beverly Hills." Vancouver's real estate boom is creating another crisis. Developers are moving in and the farm must move its largest site this fall. Ableman is working feverishly to find another spot in the area so people like Hayes can continue to work there. Hayes pulls no punches about what would happen if he didn't have the work. 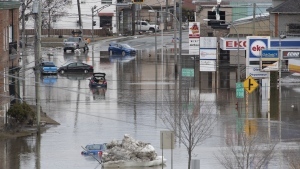 "I was in and out of recreation centres, we'll say, and so I'd probably be dead."